First and foremost, Power Poker is a US friendly online poker room. They are one of many, but next to power houses such as PokerStars and Full Tilt Poker promoted on sites such as PokerFree.co, they are a nice addition to the list of promoted online poker rooms on Poker Bonus Help. Power Poker is licensed and regulated on Malta, which means that it's a poker room with a UK white list status. A UK white list status means that the integrity and fairness of the poker room is tested by a special department from the UK/Maltese government - in short terms: your money is safe, and they operate an honest business. 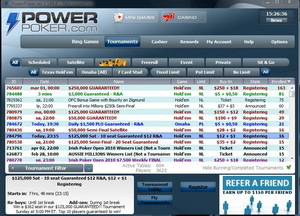 Power Poker was launched early 2009, and makes use of the Cake Network poker client. With Ilari "ziigmund" Sahamies on board they've teamed up with one the world's best known high stakes poker players, and of course they offer various promotions where you can play against him - even lower stakes games. Just as any other poker room on the Cake Network, Power Poker offers a variety of games, and types, to choose from. More about this later in our section "Traffic and Game Variation". The complete first deposit bonus Power Poker has on offer is not really easy to clear for beginners, but this is not a very disturbing fact as Power Poker pays out its bonus in chunks of $5. If you think you have what it takes, go for the full bonus of 110% up to $600. Be sure to read all the details about the Power Poker bonus on our dedicated page. In the following part of our Power Poker review you can read in-depth information about Power Poker's client, website, security & integrity, traffic & games, bonuses & promotions and support. Power Poker uses the Cake Network poker client. Over the years, this client has grown to a very decent one, with - just like most respectable online poker rooms - every feature you may wish for. A nice and remarkable feature is that they allow sharing of hand histories over an internet address, which enables you to discuss specific hands with your friends. The downloadable Power Poker client has a size of 15 Mb, which means it will download in seconds. While installing the client it will continue to download the poker room to your computer, but again it won't take more than a few minutes before you can play. Unfortunately, Power Poker is only available for Windows. 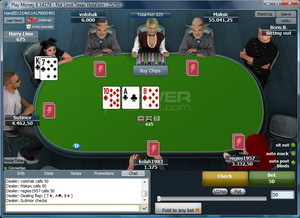 Mac users are determined to use a program such as Parallels to be able to play on Power Poker, as there is no instant play version available either. One of the best things Power Poker allows you to do is to change your screen name every 7 days. This means that you can protect yourself from other players and look like a rookie when they try to track you down on sites such as Sharkscope.